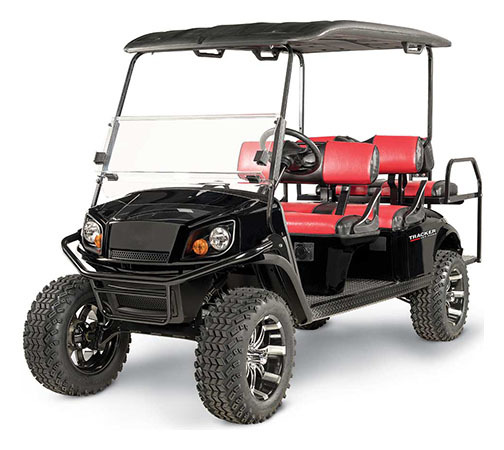 When you and yours are ready to ride on or around the beaten path, the TRACKER LX6 Electric and its powerful 72-volt AC motor will carry you off quietly and in style. With seating for six, rugged tires and higher ground clearance like its gas powered sibling, the LX6 Electric is the perfect ecological solution for your mobility. 23 in. all-terrain tires, 82 in. top, front brush guard, state of charge meter, rabbit / turtle speed switch, dual usb ports, fold-down windshield, headlights, taillights and brake lights, canopy top, split windshield, strut kit and state of charge meter.